-2- Abstracts of Local Library Programs - Abstracts of all Local programs in the UCC Library have been bound together. These abstracts are available in the UCC Library. Revisions will be sent to holders by means of numbered notices. Introduction to Job Control Language - An explanation of the most frequently used Job Control Language statements as well as examples of its use with FORTRAN (G) and PL/1 has been prepared by the Computer Center staff. The manual also contains a glossary of computer-related terms. It is available to Faculty members at the UCC Library. WATFOR Error Messages - Since the WATFOR error messages are updated frequently, current copies are available in the UCC Library. REFERENCE MATERIAL The UCC Library has several sources of reference for users of the Computer Center. The librarian will assist anyone interested in using the reference material. Most of the material may be checked out for two weeks or longer, if necessary. Books - There are a limited number of books in the UCC Library . The user should go to the Math Library for a larger selection of books on computers and computer-related topics. A list of computer-related books available in the Math Library is posted in the UCC Library and is supplemented once a month by the Math Library's acquisition list. The UCC Library has conference proceedings, reports, and symposiums, including the AFIPS Conference Proceedings from Fall 1962 to the present. There are also mathematical handbooks and dictionaries available for reference in the library, as well as bibliographies and catalogs of books, government documents, computer products, and films. Periodicals - The UCC Library has a limited number of periodicals on computer-related topics. The user should go to the Math Library for a greater selection and for guides to periodical literature. The UCC Library has permuted (KWIC) indexes to the Computing Reviews which give a comprehensive bibliography of all computing literature. 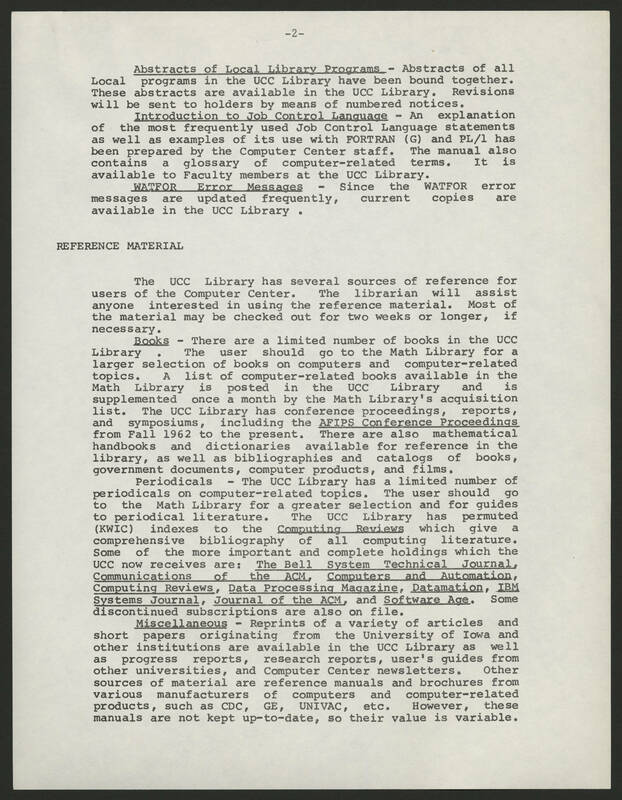 Some of the more important and complete holdings which the UCC now receives are: The Bell System Technical Journal, Communications of the ACM, Computers and Automation, Computing Reviews, Data Processing Magazine, Datamation, IBM Systems Journal, Journal of the ACM, and Software Age. Some discontinued subscriptions are also on file. Miscellaneous - Reprints of a variety of articles and short papers originating from the University of Iowa and other institutions are available in the UCC Library as well as progress reports, research reports, user's guides from other universities, and Computer Center newsletters. Other sources of material are reference manuals and brochures from various manufacturers of computers and computer-related products, such as CDC, GE, UNIVAC, etc. However, these manuals are not kept up-to-date, so their value is variable.